It’s been an exciting week for me. In my day job, I’m deliriously happy about a couple of projects with amazing authors that are coming my way, one of whom is already a star in his own right and one of whom I expect will be soon. More importantly, things have been clipping along with my books! My first-page critique session last Saturday was a smashing success, and interest in Soulwoven has positively skyrocketed since I did it. I can’t tell you how gratifying that is to me. Almost 2,500 people have read the book in its entirety on Wattpad. That’s solid, midlist-level success, and it’s only the beginning! 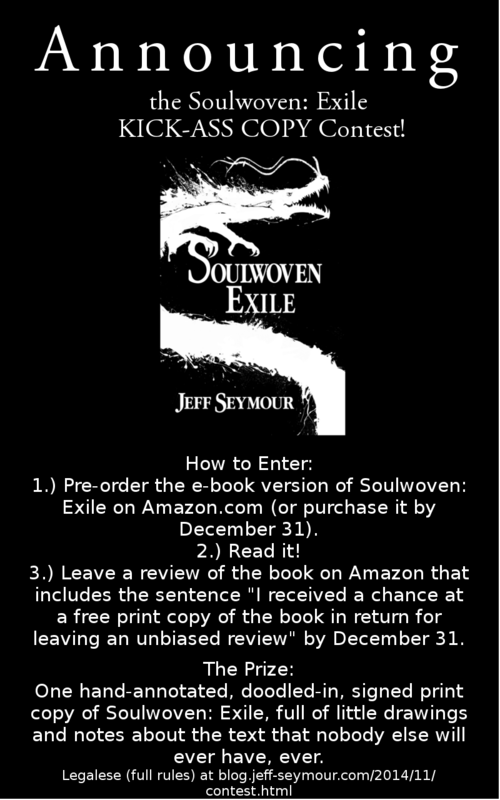 Also, I’ve finally cracked the egg on Soulwoven: Exile, the second book in the series. I’ve been experimenting with outlining the story, which is something I didn’t try for the first book, and it’s really helping me wrap my head around things. The beginning still needs work, which is why it isn’t up yet, but the middle is in solid shape and I have a good feeling about the end. I’ve reworked the first chapter into a shape I’m happy with, and I’ll aim to put it up in the next few weeks. And Nadya is almost ready for line editing! It’s seen additional attention on Wattpad this week as well, so I’m going to put up the second chapter. I’m extremely excited to finish up work on it and get it out into the hands of agents. I think it’s going to sell, which is a feeling I never really had about Soulwoven. I’m still waiting for copy edits on Three Dances (I was promised them a week ago) and have decided that if they don’t come in by tomorrow, I’m just going to forego them and do my best to copy edit the book on my own. It’s hard to copy edit your own work, but I’ve done it professionally, and I’ve reached the point where I just want to get this monkey in the air. So lots of exciting things! I’ll be doing first-page critiques tomorrow (Saturday 2/23) at 1 p.m. EST. As usual, I’ll reserve the first two spots for followers, so if you’re interested, send me a private message linking me to the story you’d like critiqued. Happy winter, dear friends. There’s snow on the ground, and it makes me feel that all is right with the world.